Bermuda grass (Cynodon spp.) is a warm-season grass, meaning that it greens up in spring, flourishes in summer and finally loses its color, going dormant in autumn. Bermuda grass grows in U.S. Department of Agriculture plant hardiness zones 7 through 10. When to aerate depends on the condition of the grass and soil. Timing depends on when it turns green in your area. Compacted soil and the buildup of thatch, a layer of dead grass at the bottom of Bermuda grass, are the main reasons that Bermuda grass needs aeration. As long as Bermuda grass is not suffering from drought, you can aerate it any time during its spring to early autumn growing season, but the best timing varies. When Bermuda grass is turning green in early spring, its tender shoots and roots are using stored energy, so this is not a good time to aerate. If you only aerate your grass once a year, the best time is late spring or early summer when your lawn is completely green and the soil temperature is above 80 degrees Fahrenheit. Aerate when the soil is moderately moist. Aerating wet soil is messy and leads to more compaction. If soil sticks to your shoes, delay aerating until the soil dries out. For small areas, you can use a hand aerifier that you push into the soil with your foot. For larger areas, rent a roller aerifier with hollow tines on a drum. As you roll the drum, the tines, usually about 6 inches apart, punch into the soil and remove cores of soil. A power aerator has a piston that drives hollow tines into the soil -- usually 2 inches apart -- and has the advantage of not tearing the grass. 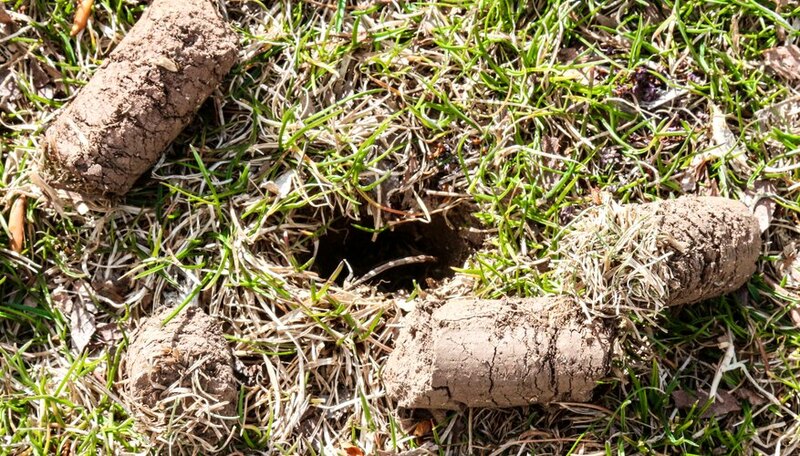 If you aerate and remove cores of soil, you can leave them on the surface of the grass to deteriorate. You can also let them dry and then break them up by dragging weighted chain-mail fencing or carpet over them. You can get rid of them using a dethatch attachment on a rotary mower as well.